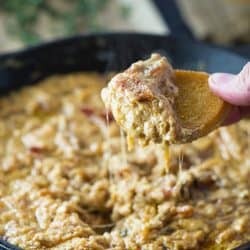 Slow cooked caramelized onions smothered in a warm Gruyere dip with bits of bacon and warm bread for dipping. Why oh why did I let myself make this? I can’t even say the name of it without drooling. 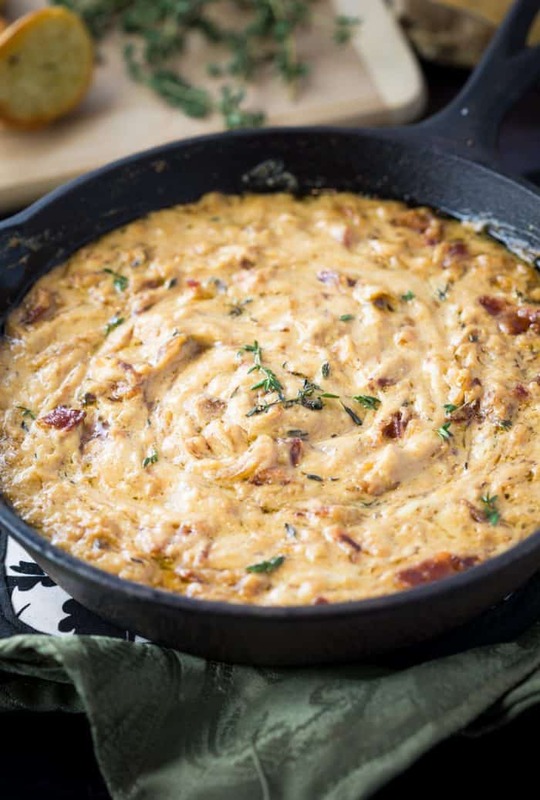 Hot Caramelized Onion Dip with Bacon and Gruyere. See? I drooled. This is the most sinful dip I’ve ever eaten. (And I’ve eaten a lot of dip in my day.) Anything with caramelized onions pretty much has me hooked. Clearly it’s what makes French Onion Soup so good, but have you ever had a French Onion Burger? Oh man… you’ll die. You know what? I think I’m going to need about 600 onions after this. …No but literally, 600 onions. Have you seen onions caramelize? You always think you have too many of them and then BAM. They reduce, and reduce, and reduce even more. By the time they’ve finally reached that rich, golden brown color, they’re like… this little pile (of deliciousness), and you wonder where the heck all the onions went! I’m dumbfounded every time. Have I mentioned that there’s bacon in this? 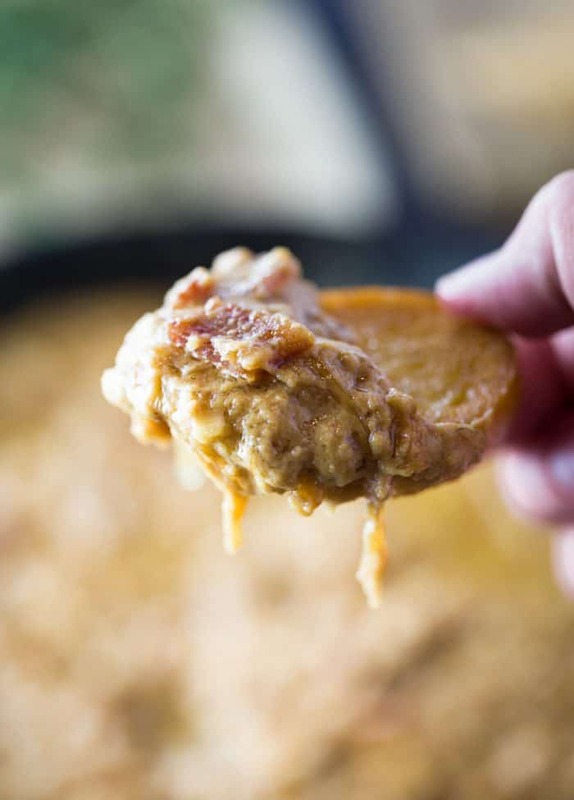 Can you say no to ANY dip that has bacon in it? I think not. I’ll warn you- Gruyere isn’t cheap. But it’s just worth every single drool-worthy, mouth-watering, sinfully delicious bite. I promise. It’s not like me to drop $7 on a little block of cheese but really- it’s pricey for a reason. And once you taste it, it’s instantly justified. Let’s see how CLOSE I can get here…..oh yeah. Look at that bacon. Whoa baby. Cook bacon in a nonstick skillet on medium heat until crispy, remove from skillet and set on paper towels to drain excess grease. Crumble when cool enough to handle. Leave remaining grease in skillet and add onions, sugar, and salt. Cook on medium-high heat for 5 minutes, then reduce heat to medium and cook slowly, stirring occasionally. The onions will eventually change to a deep brown color- be patient during this process as it can take 30 minutes or longer. Make sure that the onions don' t burn- if they are cooking too rapidly, reduce the heat further. Add the sherry and let simmer for one minute. Add thyme and Tabasco and remove from heat. Combine the sour cream and mayonnaise in a separate bowl. Add the cheese, bacon crumbles, onion mixture, and black pepper. 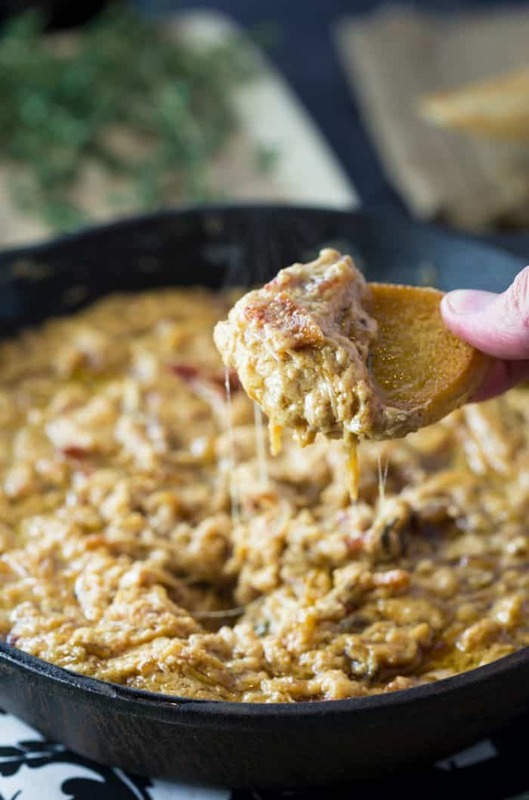 Pour into a 2-cup baking dish large or cast iron skillet. Bake for 20 minutes or until dip is golden brown and bubbly. Cut french bread into 1/2 inch slices, brush with olive oil and sprinkle with fresh thyme. Place in a preheated 350 degree oven for approximately 8 minutes, Remove and let sit until cool enough to handle, then dip and enjoy! Sorry I am so late to Fiesta Friday! I am so glad that I didn’t miss this recipe. It will be at my next football party! Thank you so much Julie, I really hope you enjoy it, (although I don’t see how you couldn’t!) Perfect for fall and football season for sure! 🙂 Thanks for visiting, glad you still came to check out the FF recipes!